Secretary of Defense James Mattis said the United States is intent on strengthening its security relationship with India. “Our intent here today is to continue to strengthen the relationship and to make certain that it gets stronger year (sic) between two democracies that have many common interests, many common security challenges,” Mattis. Doval called for the need for “incremental improvement” and cooperation to make the world more safe and more peaceful. “We share the values. We share the democracy. We all have the very common objective and interest both for the region that I come from and also globally that’s able to work together, share our ideas and thoughts and bring about some new innovative changes and improvements that could really serve the purpose or the objectives …” Doval said, adding that he hoped with a new administration would build on the substantive gains of the past. In a later readout from the Department of Defense, “Secretary Mattis specifically applauded India’s efforts to promote stability in the South Asia region.” and both reaffirmed building upon the significant defense cooperation progress made in recent years. 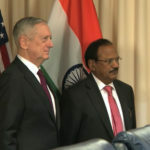 Mattis and Doval further discussed collaboration on a wide range of regional security matters including maritime security and counter terrorism. The two pledged to continue the strong defense partnership between both nations, the readout said.